If homemade bone broth isn’t part of your healthy lifestyle, I highly recommend you incorporate it. It’s a cheap and effective way to get a ton of nutrition in your diet. 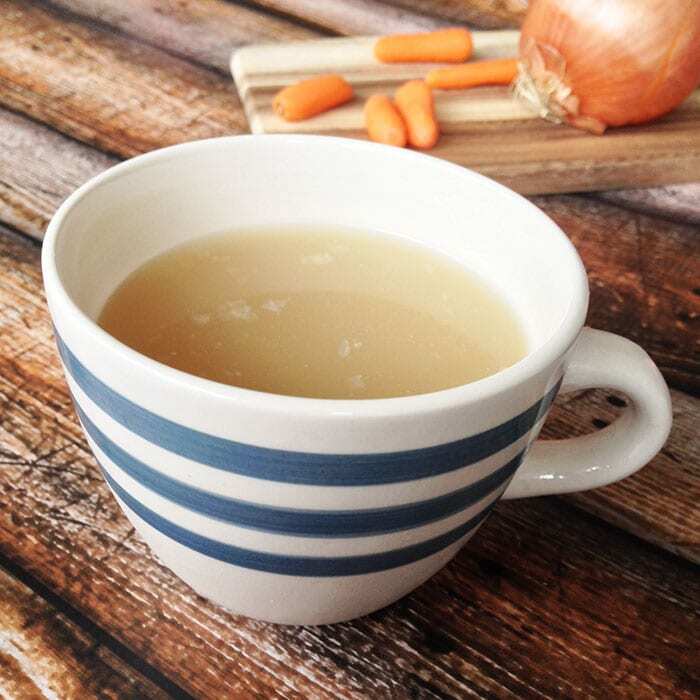 Continue reading and I’ll show you how to make bone broth. Bone broth (or stock) has been around for hundreds of years and has been used as a healing source ever since! In fact, this is the very reason why your mother or grandmother gave you chicken soup when you were ill! Bone broth is a combination of animals bones, water and aromatics that is simmered for an extremely long time to leech out deep flavors and a concentrated source of nutrition. Aside from it’s healing properties, bone broth also adds a significant depth of flavor to dishes — flavors that can’t be bought in the grocery store! Bone broth can be made from almost any type of animal: beef, poultry, lamb, bison and fish work especially well. Since bone broth is simmered for hours at a time, it is a powerhouse of concentrated nutrition. Not only that, it is easily absorbed by the body and doesn’t strain the body to consume (like fiber can, for example). Another significant benefit of bone broth is the extraction of gelatin/collagen. Yep, the same stuff that Jell-o is made out of! Gelatin is extremely soothing to the body and promotes a healing environment in the gut! 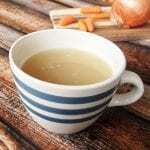 With low-carb diets, bone broth has shown to be an effective way to minimize the effects of low-carb/keto flu. Where do I get good quality bones? The beauty of bone broth is that you literally make a nutrient-dense concoction from your leftovers! I find that I roast chickens quite a bit and just save the bones, carcass and wings from those in the freezer until I have enough to make broth! If you just want to start making it right away, go to your local butcher (or possibly a local grocery store) and ask if they have any soup bones, knuckles, feet, etc. These parts are usually sold dirt cheap or even given away! If you can, try and use the bones from properly raised, pastured/grass-fed animals. If you can’t, don’t sweat it. You can still make this and benefit greatly from it! If you notice that you bone broth isn’t gelling from the gelatin, next time try to add bones that are are full of ligaments and joints. For chicken broth, adding chicken feet works wonders for creating a super gelatinous bone broth! Keep an eye on the mixture for the first hour or so. If a foamy layer starts forming on the top, simply skim it off. For the best flavor, make sure your bones are roasted, at least a little bit. If they’re raw, just pop them in the oven for about a half hour. By adding apple cider vinegar to this recipe, you are allowing the broth to pull out more nutrients and making your bone broth even more nutritious! Notice I didn’t add much salt to this dish. I do that because you never really know what application you’re using it in. I like to control the salt content of my foods. If you are using it for electrolyte replenishment, you can salt the whole thing! You can do this on the stovetop, but I much prefer to use my crockpot. Some people use pressure cookers but I have never used one. Use bone broth anywhere you would normally use stock or store-bought broth. I especially love it in soups. If rice is included in your diet, use it in place of water. It makes a delectable and flavorful side dish! If you are familiar with bulletproof coffee, I make a similar drink that uses broth instead of coffee. I blend grass-fed Kerrygold butter into my morning warmed bone broth and go. Talk about energy boost! Put chicken bones and apple cider vinegar into crock pot. Cover with filtered water until there is one inch less from the top. Put on low and simmer for 20-22 hours. Mixture should be reduced a bit. Add in remaining ingredients and continue to cook for another 2-4 hours. After the time is up, filter mixture through mesh strainer or cheese cloth, into a heatsafe bowl. Cover with plastic wrap and chill immediately. After mixture is completely cool, you'll notice it solidifying on the top. Remove the fatty layer that settles on top with a spoon and continue to cool. Store in the refrigerator for up to 3 days or freeze immediately for up to 6 months. Do you use bone broth? Comment below! Have you ever added egg shells? I have not but I’ve heard it’s great for adding nutrition!